Originally published as Karukatta no chaiya-san in Japanese. 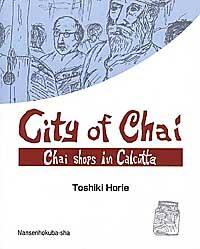 City of Chai is about tea and people who serve it in many of Calcutta's wayside tea stalls. Readers do not need to have visited that city or have drunk tea to become engrossed in this book in which meticulously studied culture and communication unfold.It is fascinating and in parts poignant reading. Author Toshiki Horie is a well-known and respected Japanese tea identity. Readers share his emotinal enlightenment sitting in makeshift tea stalls operated by Calcutta's lower caste chai vendors in the most impoverished of the maze of streets in that seething city. The author introduces boys who started work at incredibly early ages and who work 365 days a year. They toil from 4.00 am to 10.00 pm with a two-and-a-half hour break in the middle of the day. The author meets Mother Teresa at the Centre she founded in Calcutta to care for orphans, victims of Hansen's Disease (leprosy) and to enable many of the city's destitute to end their lives in peace and with dignity. City of Chai also describes vendors in Singapore and Malaysia where their stalls are somewhat more sophisticated. First published in Japanese in 1996, the book was well received in Japan. It is revealingly honest, well blended with intense and light hearted comment. Strikingly vivid drawings and detailed photographs intensify interest. For those who seek and enjoy informative, interesting reading I offer my unqualified recommendation. Born in 1936. Tea specialist. Managing Director of Musica Tea Company. Owner of Tea House Musica. Lecturer at Tsuji Gakuen and Japan Chefs Special School. He is the author of Handbook of tea (紅茶の本）and Play, See and Think with Black Tea (紅茶で遊ぶ観る考える）both published by Nansenhokuba-sha Publications. Lives in Kobe, Japan.